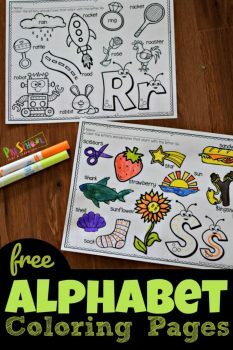 Hit two birds with one stone with these Alphabet Coloring Printables from Preschool Play & Learn! There is a page for each letter and both upper and lowercase are included. There are also things for your child to color that match the letter on the page. With this resource, you can practice letter recognition AND letter writing! It’s a two-in-one, and the coloring is an added plus! Get these Alphabet Coloring Printables here!